How compensation committees can choose the performance metrics that are right for their business. Incentive plans have two primary purposes: 1) To motivate behaviour and drive performance aligned with strategy and 2) To align rewards with shareholder interests. From these two simple purposes come the most difficult work of the compensation committee and an area of increasing focus by shareholders. Choosing the wrong metrics can create unintended consequences and erode the value of the business. So how do companies choose the right ones? Annual vs long-term metrics – what works Annual and long-term incentive plans need to be focused differently. It may not be enough to measure the same performance over different time periods; often different measures are required. The metrics in the annual incentive plan should focus on motivating behaviour and driving the specific annual performance required to keep the company on track to achieve its longer-term strategy. The metrics in the long-term plan should focus more on alignment with shareholder interests. It is particularly important that management have ‘line of sight’ for annual performance metrics – these may be a mix of financial and non-financial/operational measures. For example, if Manufacture-Co’s strategy is to double in size in five years, the metrics in the annual incentive plan may be revenue growth and a measure of growth in profitability – both tied directly to profitable growth and both metrics over which management can exercise some control. 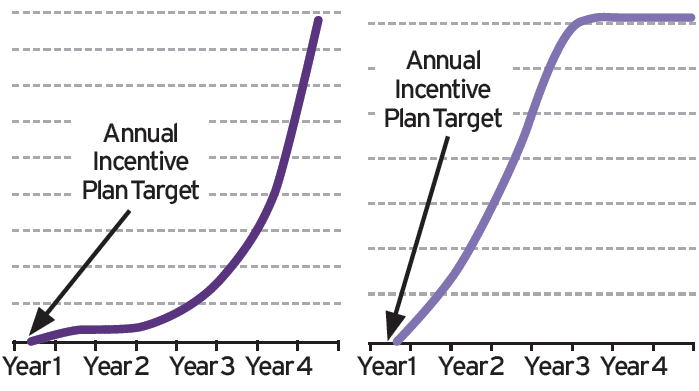 In addition, the targets under the annual incentive plan should be based on the expected development curve. In long-term plans, the focus on shareholder alignment is managed for most publically-traded companies by using company shares as currency. This does much of the heavy lifting of creating alignment, as share-based awards automatically increase and decrease in value in direct alignment with shareholder interests. However, mere share price alignment is no longer enough in the current environment. The focus has shifted to performance contingent long-term awards. 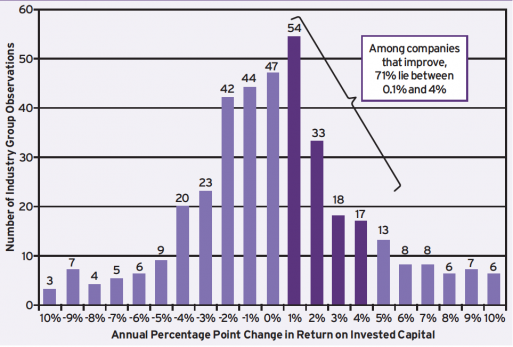 Relative total shareholder return (RTSR) is one of the most prevalent long-term metrics. It uses the market’s assessment of industry under – or out – performance and allows companies to avoid setting multi-year goals while still aligning results with performance, but does not drive particular management behaviour. By contrast, a longer-term absolute financial goal can give managers a specific goal which can be explicitly connected to the business plan (and to the annual plan measures). 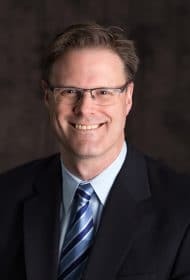 However, a multi-year financial goal may be difficult to establish and may lose relevance before the end of the (typically three-year) performance period if business circumstances change. 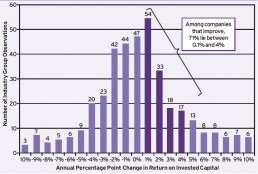 Measuring efficient use of capital with a return metric offers a middle ground commonly used in long-term plans. 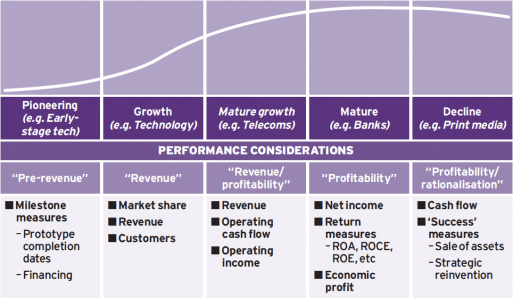 Targets tend to maintain relevance and to have natural parameters, such as the company’s cost of capital which may be used as a reference point. The chart below illustrates the importance of understanding the relationship between return on capital, cost of capital and value creation. Understanding the company’s position can have important implications for the choice of incentive plan metric. 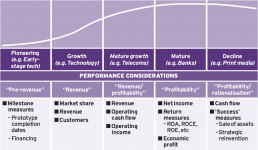 The right metrics may also depend on a business’ position in its life cycle. 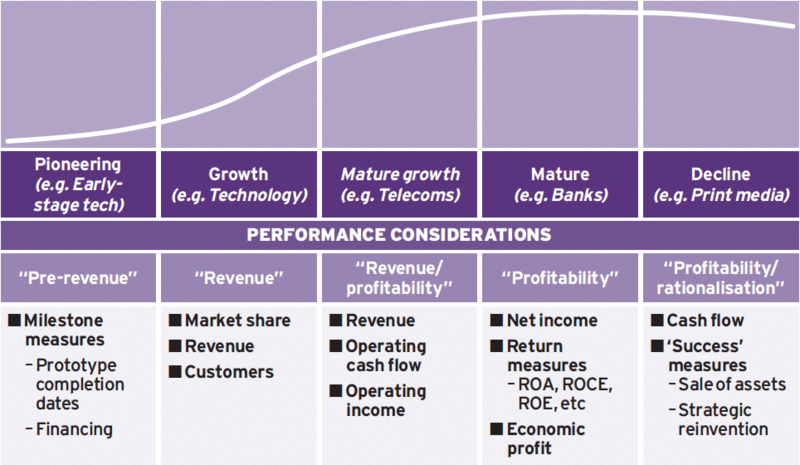 A profitability metric is not the right driver for a start-up business, but might be suitable for a more mature business characterised by limited industry growth. At the end of a business’ life, milestone metrics, for example, a metric focused on the sale of a specific business or division, may be appropriate (and may be preferable to a metric that requires targets to be set lower each year, as the business declines (see chart below). Extractive industries (mining and oil and gas) commonly have a ‘balanced scorecard’ for annual incentives, typically reflecting three broad categories of metrics – financial, operational/production and sustainability. While the use of financial metrics is generally consistent across all industries, in extractive industries, financial metrics often have a lower weighting and are combined with operational or production metrics that reflect operational excellence and are less affected by commodity price changes. As well, extractive industries need to operate safely, with minimal environmental impact and on a basis that benefits the communities in which they operate – their ‘social licence to operate’. Their annual incentive metrics tend to reflect this with safety and environmental incident targets and community benefit metrics, such as specified levels of local employment or local purchasing. Metrics under a REIT must balance two apparently competing objectives – high and consistent shareholder distributions and long-term real property value appreciation. 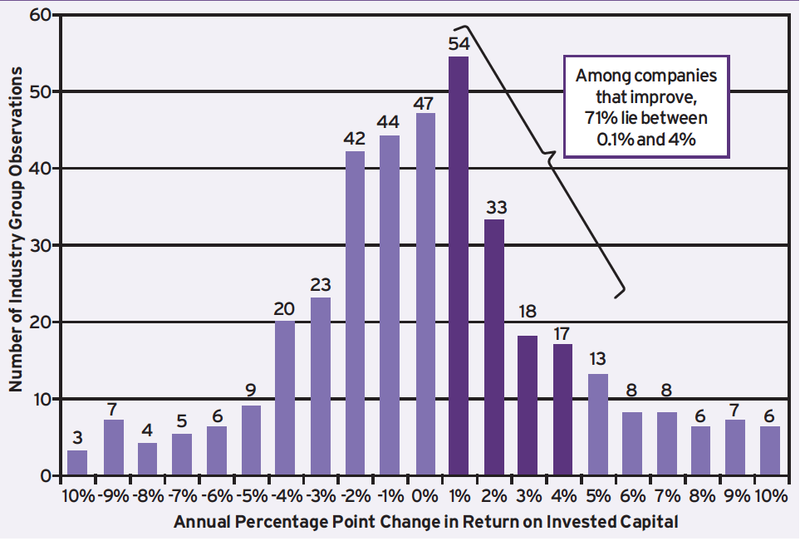 This is typically accomplished with a funds from operations (FFO) metric (which is sometimes the only metric) in the annual incentive plan, balanced with a long-term share-based incentive plan that often has a relative total shareholder return metric, to moderate the effect of volatility in the real estate market and ensure that maximum rewards are paid only when the company out-performs peers in an up market. Following the 2008 financial crisis, financial institutions have shifted the focus of their annual incentive metrics to emphasise risk management. This is accomplished in part through using risk-adjusted measures, in part through setting conservative targets and goal ranges that are achievable with an appropriate level of risk and in part through incentive structures with risk-based forfeitures and mandatory deferrals, to better align rewards with the period during which the associated risks are realised. In addition, committees are expected to use judgement to adjust payouts that are achieved by taking excessive or unexpected risks. No one of these perspectives is necessarily conclusive but in combination they provide an overlap of perspectives that helps a committee determine where performance goals should be set. 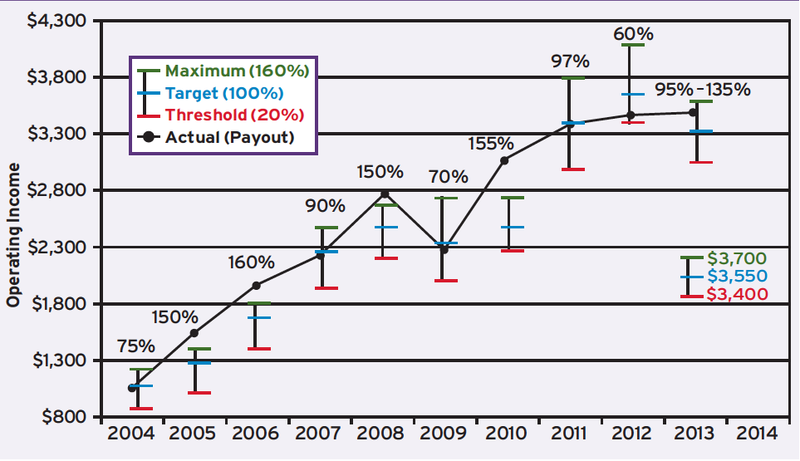 Asymmetrical payout curves, to reflect that incremental performance above target may be relatively more difficult to achieve than incremental performance below target (See charts below). 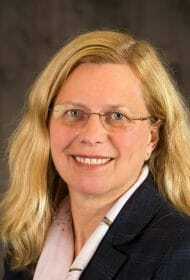 Increasingly, committees consider value sharing between management and shareholders as part of the assessment of incentive plan metrics and targets. 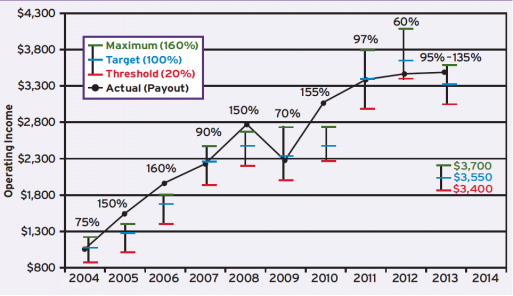 Commitees consider incentive plan payouts as a percentage either of earnings or of intrinsic value created at different levels of performance. There are no established sharing norms and limited comparative data. Sharing levels will be higher within industries with high intellectual capital (e.g. investment banking), than within more capital-intensive industries (e.g. extractive industries). What is critical for committees is to monitor the sharing ratios year over year and to understand the reason for any significant changes. Similarly, when considering changes in incentive plans, the payouts and sharing ratio under the new plan should be modelled and compared with the payouts and sharing ratio under the current programme and the rationale for any differences understood. 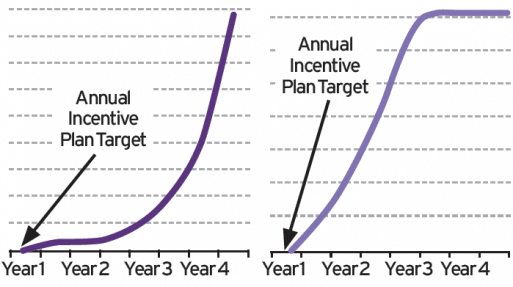 The rule of unintended consequences must be kept front of mind when designing incentive plans. Flaws in the incentive design or metrics chosen can have negative consequences for the business. For example, a revenue growth metric may drive unprofitable growth while a profitability metric may cripple the long-term health of the business by delaying needed capital improvements. Choosing appropriate metrics, balancing annual and long-term performance and maintaining committee oversight and judgement can help to avoid unintended consequences. It is better to be mostly right than precisely wrong. Proxy advisors and compensation committees both like relative total shareholder return plans. In the right circumstances, a RTSR plan can reward industry outperformance and moderate the influence of macro-economic or commodity price influences. RTSR plans also make target setting easy – a committee can choose appropriate levels of relative performance (e.g. top quartile for maximum performance, middle of the pack for target, bottom quartile for a zero payout) and then let the market operate to measure performance. For companies with strong industry peers, particularly where financial and share performance are affected by commodity prices, a RTSR metric is a shareholder-aligned, market- efficient measure of performance. For a company that does not have a reasonable group of performance peers or appropriate index, the RTSR plan is a throw of the dice – payouts may bear no resemblance to performance. For these companies, committees should stick with the much more challenging task of setting long-term absolute performance goals. In general, management should identify transactions to be adjusted at the start of the year. This allows for adjustments to be made on a principled basis, before their positive or negative impact on incentives has been determined. Where adjustments cannot be anticipated, the committee should be apprised of anticipated adjustments as events arise, rather than after the end of the year. 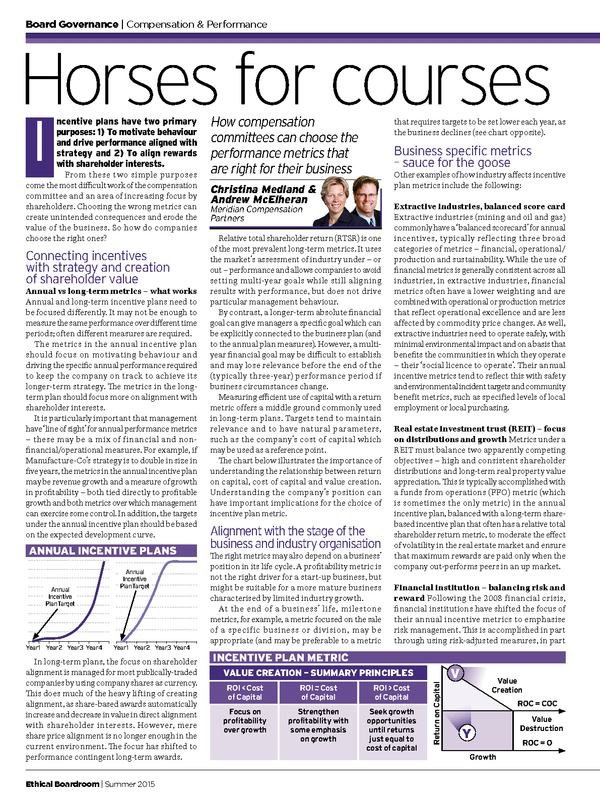 Choosing the right performance metrics for the particular business is challenging and something that should be regularly reviewed; metrics that were effective in the past will not necessarily drive performance and align with strategy going forward. This article originally appeared in the Summer 2015 issue of Ethical Boardroom.